When Canadian journalist Joanna Chiu spoke out on Twitter about her experience of sexual harassment on a plane, others came forward with similar stories. Joanna tweeted that a man in his late 30s, sitting behind her, had been "obviously delighted" to be seated next to a teenager separated from the rest of her family. "She was friendly and he seemed to take that as a welcome cue to get very familiar and started teasing her and kept saying that he wanted to take her out to eat, which she was ignoring," Joanna wrote. And then she had heard him lean in and ask for a "dirty photo". "I turned around and rage-whispered exactly what I thought of that," she said. Joanna said the flight attendants, who had then ensured that the man had been removed to another seat, and other women on the plane had handled the situation really well but none of the male passengers had really noticed what had been going on. And other Twitter users were able to relate to this. Lauren Young tweeted: "Women looking out for women - I've done it, had it done for me, yet still so happy to hear stories like this. "Also glad the airline took action - gives me hope that our culture is changing." 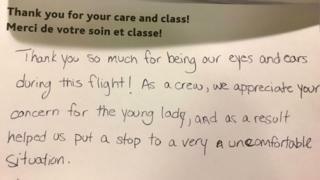 Joanna had written: "This Canadian airline crew handled the situation so well. "They even gave me and another woman a card." She also described how she had herself been sexually harassed on a plane as a child. "The first time I travelled without my parents, the man next to me spoke with me most of the flight, which made me feel adult and important," she wrote. "And he said things like I must be flirting because I was touching the zipper on my jacket. "The second time I travelled alone, an older man struck up a conversation while we waited for boarding. "And he asked about many details of my travels then kissed me without my consent." These candid accounts also resonated with others on social media. Joy Castro tweeted: "Travelling alone often as a teenager, I encountered such situations frequently. "No-one ever intervened and it was always so awkward and scary, extricating myself without making some predatory weirdo angry." @playingwithu tweeted: "My 14-year-old daughter was stuck next to a creepy adult man when flying alone internationally, back from a veterinary medicine educational trip in Costa Rica. "No-one helped her during his increasingly inappropriate and aggressive comments. "She finally got him to stop by ignoring him and instead taking out a chunk of faux skin she had in her bag and practising sewing her surgical knots. "Apparently, it grossed him out enough to stop bothering her." Pat tweeted: "Being a flight attendant, I have always briefed unaccompanied minors to never hesitate to find us if they are uncomfortable during a flight and I'm doing a lot of aisle checks also to make sure." Meanwhile, some fathers shared their concern for their daughters flying on their own.